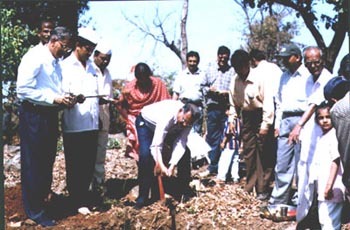 On 30th January 1998, during the prayer meeting organized by AFH, it was proposed that based on ideals of Mahatma Gandhi that progress must start with the development of small villages, Asian Foundation for Help decided to adopt a village for development. After a mammoth task, Devkundipada, a small village located approx 60km from Mumbai in Taluka Vasai, District Thane in Maharastra with a population of approx. 250 was selected for adoption and a five-year plan implemented to develop this. Villagers here are lacking in essential facilities like health, Education, Water supply, Employment and Sanitation. Furthermore, the village remains totally disconnected from main land for 7 months each year due to a lack of bridge over the river and connecting roads. Taking into account the local problems of this and adjacent villages, AFH conducted diagnostic research and have realized that malnutrition, diarrhea, tuberculosis are quite common in addition to health and education. 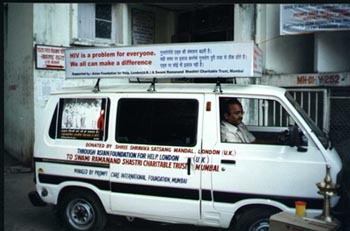 Subsequently, free medicines for this cure are being distributed and the villagers are being made aware of personal hygiene. A primary school, Balwadi was started from academic year June 1998 and textbooks; educative games etc have been freely distributed. Treating malnutrition, diarrheal diseases, tuberculosis and hypertension. We would like to promote each class in every academic year. Free distribution of text books, note books and educational games. At present, a single open well is used for drinking water. We plan to provide purer water by separate pipeline through the well or river. Construction of toilet facilities for each house separately is considered to control diarrheal diseases. A separate drainage pipe is also proposed for drinking water. Construction of a bridge over the nearby river shall assist transportation and logistics. Training for the handicraft to be provided to the villagers with end products to be sold in Mumbai to provide employment and income to the villagers. Training for creation of handicrafts, raw materials and transportation for its sale. 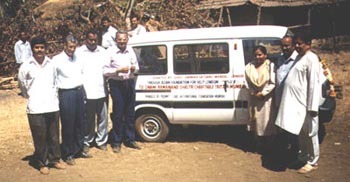 Villagers to be trained and encouraged to use in modern techniques of farming and logistics provided to sell their produce in Mumbai. Provision of training of farming, seeds, plants and transport.